I wanted to share this recipe with you for the perfect dessert - easy to make, minimal ingredients, tastes delicious, and pretty to look at. I serve these in little vintage tea cups and saucers for the cute factor, which I picked up from a local charity shop. I was made these by a friend earlier in the year who inspired me, although I think the recipe was originally from Jamie Oliver's Great Britain book. The brandy is completely optional, I've made it both with and without and it works both ways. You could also substitute the brandy for rum, or another alcohol. 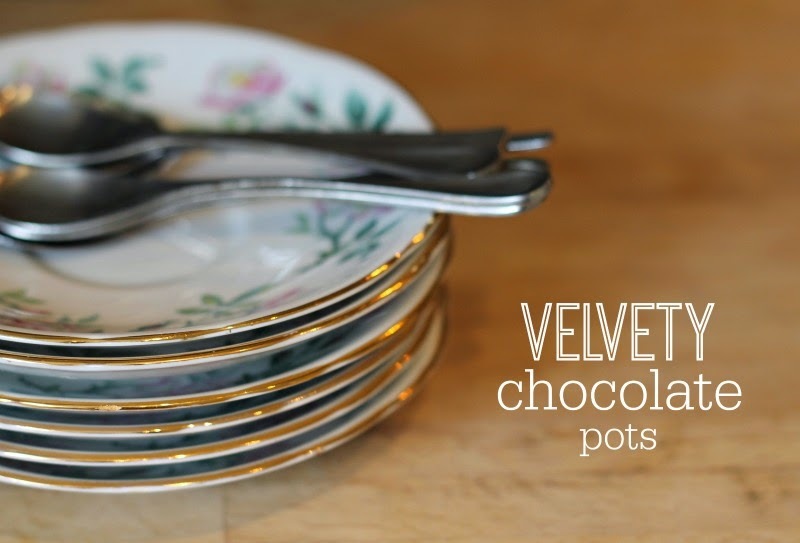 The method is really simple - start my breaking up the chocolate and melting it in a bain-marie. Once melted, leave it to one side to cool for 15 minutes. In another bowl whisk the double cream and sugar with an electric whisk until it starts to form very soft peaks. You don't want to over whisk it! Then, gradually pour the melted chocolate into the cream and fold together gently. Again, don't over stir! Pour the mixture into your cups/bowls/glasses and leave to set for a couple of hours in the fridge. I like to serve with chocolate dipped strawberries, or a sprinkling of raspberries. Don't be fooled by these little beauties, although they may seem like small portions a little really does go a long way. Perfect for this bank holiday weekend to have with friends... or alone. You know you want to! These look so lovely in the little tea cups! Oh my godddd this sounds delicious! These look delicious :) I love your blog and I have followed you with Bloglovin. If you ever get a chance to check out my blog I would be delighted thanks! These are literally the cutest little things! I will be making them! So easy to do as well! These are lush! Love them!